Attorney General Bob Ferguson announces a lawsuit against the federal government over hazardous tank vapors at the Hanford Nuclear Reservation. He is joined by affected Hanford workers, including Steve Lewis, far left, who also spoke at the event. SEATTLE — Attorney General Bob Ferguson filed a lawsuit today against the U.S. Department of Energy and its contractor, Washington River Protection Solutions (WRPS) alleging that hazardous tank vapors at the Hanford Nuclear Reservation, pose a serious risk to workers at the site. The 586-square-mile Hanford nuclear site located on the Columbia River in Eastern Washington was used to produce plutonium for the U.S. nuclear weapons program from 1943 to 1987. Production of weapons for World War II and the Cold War left behind large amounts of solid and liquid chemical waste — much of which is also radioactive. Under a court order to clean up what is one of North America’s most hazardous sites, the federal government employs Washington workers to remove the 56 million gallons of nuclear waste that is located in 177 underground tanks — enough to fill roughly 88 Olympic-sized swimming pools. 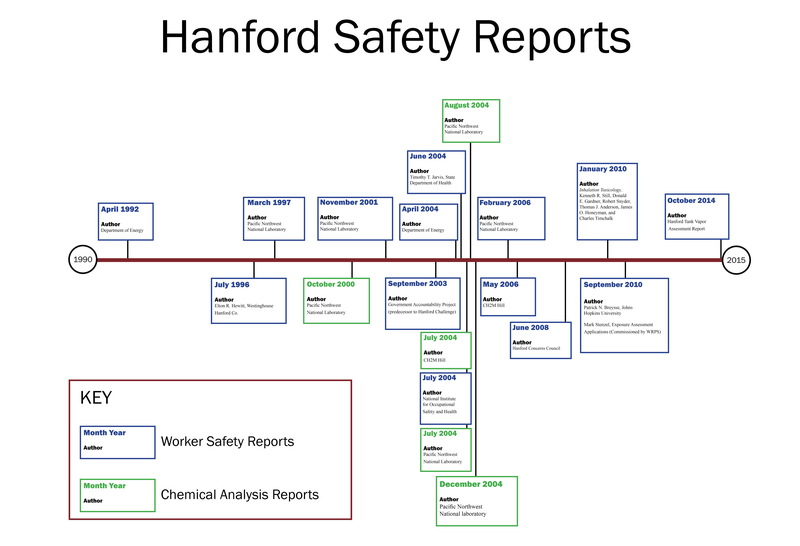 On June 20, 2014, in response to increasing reports of workers falling ill after chemical vapors escaped from the tanks, Ferguson and Governor Jay Inslee wrote to the U.S. Secretary of Energy urging an independent safety assessment of workers exposed to the vapors and toxic fumes emitted from the Hanford tanks. The 2014 report was the latest in a series of studies over the last 20 years assessing the problem of Washington workers falling sick after exposure to toxic gases emitted from the waste holding tanks. Since 1987, hundreds of workers have fallen sick after vapor exposure, experiencing nosebleeds, headaches, watery eyes, burning skin, increased heart rate, difficulty breathing, dizziness and nausea. Some workers have suffered long-term disabilities, including the permanent loss of lung capacity. Some 1,500 different volatile chemical gases — many of which are highly toxic and known carcinogens — have been found in the tanks. Exposure to these chemicals is known to cause numerous harmful health impacts including lung disease, central nervous system suppression, nerve damage, and cancers of the liver, lung, blood, and other organs. Despite 20 years of study and multiple reports, the federal government has not implemented a lasting solution and workers continue to get sick. Since March 2014, at least 50 workers have sought medical attention for exposure to chemical vapors at the site. In June 2015, another 13 workers were exposed to vapors. Just weeks ago, on Aug. 14, an instrument technician at a double-shell tank farm was exposed to apparent vapors. He was not wearing respiratory protection because none has been required in the double-shell tank farms. In November 2014, Attorney General Ferguson filed a notice of intent to sue the U.S. Department of Energy for its ongoing failure to ensure the health and safety of the Washington workers involved in the Hanford nuclear site cleanup. In February, WRPS issued an implementation plan that identified a number of measures that could be undertaken to improve worker safety. However, the plan lacked details and U.S. DOE has not committed to any specific actions or timeline. Today, the Attorney General filed suit in federal court in Spokane seeking a legally enforceable agreement requiring the federal government to take immediate action to remedy the dangers currently posed to workers at the Hanford nuclear site.